The quest to stay commercially relevant is notoriously harsh and demanding, as the majority of bands who embark upon it soon find out. In most cases quality is quickly usurped by quantity, and standards degenerate as rapidly as bands can pump out singles and albums. Although it would be a sweeping and incorrect generalisation to suggest that all such bands regret their decision to aim for the mainstream, those that do so too hastily tend to be found wanting sooner rather than later. Biffy Clyro’s decision to wait some three years to release their newest album seems wise in this context, as the temptation to pump out radio friendly soft rock tunes with catchy choruses must've been difficult to suppress. Unfortunately, all they've done with Opposites is craft a compendium of them. Biffy Clyro’s prolific rise to prominence since 2007’s Puzzle has been remarkable. Three albums under their belts and with a bearded Scottish die-hard following already in tow, minor tweaks were made to transform their eccentric alternative rock style to launch it into the mainstream. Following Puzzle, Biffy Clyro’s focus had shifted. Their aspirations leant themselves more to popularity than loyalty, whilst the emphasis on bigger choruses and conventional song structures saw an end to long instrumental passages and the screams of Simon Neil. What’s more, Only Revelations took a step further from their origins, stripping the reverb-drenched guitars of their ferocity and allowing their pop sensibilities to become the fulcrum of their sound; epitomised by the irrefutably catchy "Mountains". 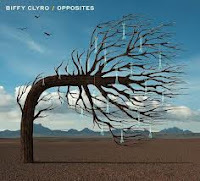 But whilst their fourth and fifth albums employed different strategies to their earlier releases, they both still came with a decidedly Biffy twist and were as great as they were diverse. With Opposites, Biffy Clyro have diluted their sound even further, with the focus almost exclusively on by-the-numbers, mid-tempo rockers with big choruses and even bigger stadiums in mind. The cookie-cutter moments that were scattered amongst the finer moments on Only Revelations have outmuscled the quirky and energetic cuts on Opposites, with newer fans more likely to be appeased than old. Few exceptions permitting, none of the tracks possess the grit of "Toys, Toys, Toys, Choke, Toys, Toys, Toys", the progression of "Only One Word Comes To Mind", or the grandiosity of "That Golden Rule". The intro of "Stingin’ Belle" hints at a return to the aggressive riffs of old but is reined in with one of the poppiest choruses on the album, whilst lyrically encouraging criticism with damning statements such as “Grow some balls, and speak your mind.” "The Fog" is one of many which fleets by all too inoffensively, whilst "Pocket" is so upbeat and friendly that even the radio winces at its tenuous nature. The finer moments on Opposites arise when the band allow themselves to stray from the formula, turn up the distortion, and leave their reservations behind. Whether it’s the jagged, intermittent riff which features heavily on "Sounds Like Balloons", the determined energy created on "The Joke’s On Us", or the rhythmically brilliant "Modern Magic Formula", Biffy Clyro show that they can marry big choruses with substance and create anthems without focusing purely on doing so. The biggest problem with Opposites is not that the material is poor; it’s that in its quest to be an anthem-laden mammoth the album has merely succeeded in being forgettable.